Ewan McIntosh is my hero! He is the inventor of TeachMeet. Yes, inventor is the right word, because TeachMeet is an ingenious invention, it's a life-changing experience. Those who have never taken part in one won't understand what I'm talking about; those who have are most probably hooked for life. The reason why TeachMeets have taken the educational world by storm is actually quite simple: They give ordinary teachers the opportunity to speak, to present, to share and to connect with other like-minded teachers. TeachMeets are organized all over he world. On Friday the world record was broken at the Sydney TeachMeet - more than 330 particpants gathered to listen to 40 speakers - Ewan McIntosh was also there - and so was I - even though my presentation was a virtual one, via Skype, I could feel the extraordinary atmosphere at the ATP Eveleigh event, which Simon Crooke described so wonderfully in his blog post 4 Pubs and a Bar: A TeachMeet Tale. 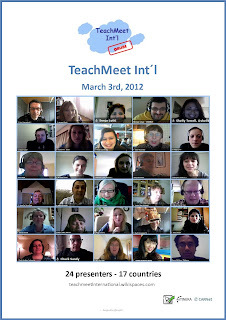 On Saturday we organized the second virtual TeachMeet Int'l. I dare say it was equally successful as the first one. The speakers were brilliant, the topics varied, the backchanneling lively. First-time speakers presented alongside experienced conference-goers. Everybody was given the same amount of time and everybody was interrupted with a (monster) bell if they crossed the time limit. We used a different platform yesterday, and yes, there were glitches and hitches, because Adobe obviously has its pluses and minuses, just like Live Meeting does. But in the end, TeachMeet is not about technology, it's about sharing great ideas and best practice. It's about teaching and learning. I completely agree with Marijana! Your boundless energy and enthusiasm shine through this lovely post. Thanks so much for everything! After yesterday's event when I presented for the first time, I guess I am one the ordinary teachers "hooked for life". I loved the atmosphere, the variety of topics, even the "monster" bell was fun. I also want to thank you for your participation in the TeachMeet as well as for your wonderful presentations. It's because of you that the TeachMeet was such a great success. You're my heroines.